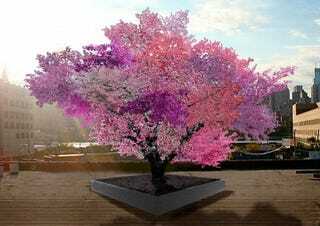 This tree growing 40 different types of fruit—including varieties of peaches, plums, apricots, and almonds—may look like something plucked straight from the imagination, but it’s very real. 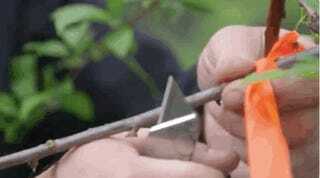 And this is how it was made. Last year, we featured this 40-fruit tree from artist Sam Van Aken. We already knew how the tree was made, of course: chip grafting (like you see here) is a fairly simple, and a very old, agricultural process. It’s not so much the technique that makes the tree exceptional—it’s the scale. Managing to get 40 different varieties of stone fruit, with different growing and blossoming cycles, to work together is as much an organizational problem as an agricultural one. In a new interview with National Geographic, Van Aken explains exactly how the whole mapping process played out, both in the first tree above, and in the full dozen he’s created since. Right now, Van Aken says that they’re mostly in museums, but the plan is to plant them in places where people are likely to stumble on them, and then wonder over.